The joke around here is that we have two seasons, winter and road construction. I actually think there are three; winter, road destruction and road construction. The middle season is very short and usually involves barrels and barricades and moving 4 lanes of traffic onto the shoulder, particularly between the hours of 6 and 9 a.m. or 4 and 6 p.m. 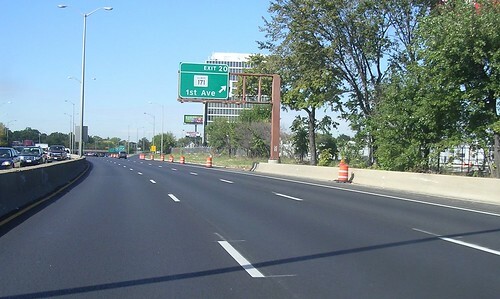 Most of the route from the point where the Eisenhower Expressway meets the bridge that crosses the Kennedy Expressway out to the 'burbs has been resurfaced. There are a few spots left to do but it's a wonderful drive. I was back at the office within 40 minutes. For those who know, the board at the Post Office said "13 minutes to Mannheim". It was just that. I know this was paid for with stimulus money and there is a huge debate about whether sinking billions into infrastructure actually created long-term jobs, which is what we need right now. I know that people with whom I'm acquainted with in the construction industry were grateful for the money as they could hire more workers, many of whom had been laid off for 9 months. I also think, for those of us who have to spend our time driving on these roads, making the commute a nicer ride is a good thing. Yes, to the left you see ubiquitous stopped in-bound traffic. Still, when the road is clear and it's a smooth ride back to the office, your frame of mind is that much nicer.